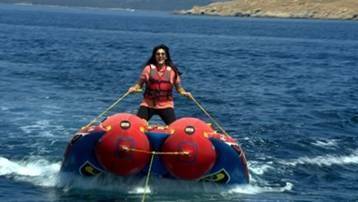 NDTV Good Times presents ‘Bucket List Costa Smeralda’, a two part travel series hosted by none other than Ambika Anand. Yes, you read that right. Ambika Anand is all set to check off her bucket list in style in Costa Smeralda, the spectacular 30km stretch in the gorgeous Italian island of Sardinia. Living the high life in one of the most expensive properties in Europe- Ambika’s bucket list includes shopping for the finest, flipping the perfect Italian pizza, getting a 2 star Michelin chef to prepare a meal exclusively for her, snorkeling in the bluest of blue and so much more! In this two part series, audiences who love travelling to exotic places and learning about new cultures, will find itineraries that fit their speed and preference. The excitement has just begun, all you have to do is sit back, relax and watch the show to make your own Bucket List, a little longer. The show discovers the ultimate to-do list for travel lovers as Ambika will explore the tourist destination. Nivedita to stop Neil and Ragini's wedding!